Proper functioning of the aboiteau; is it allowing for fish passage? We are following up with Agricultural New Brunswick for more information. An as yet unidentified culvert -We are hoping to identify its location at our next meeting. Restoration efforts in the upper reach should focus on understanding in greater detail the source and movement of sediment and then designs can be implemented to narrow the channel along reaches where there is widening. Narrowing and stabilizing the channel width typically creates deeper habitat that is favourable for species such as the Atlantic salmon and brook trout. Restoration possibilities in the lower reach should focus on establishing a vegetated riparian buffer at a minimum of 5 m where farm fields border Demoiselle Creek. All of the culverts identified had some sort of debris or vegetation either upstream, within or downstream of the culvert that was impeding flow to some degree when they were evaluated by the DoT in the summer of 2012. General pesticide and/or herbicide concerns were described but without known individual users, this is difficult to touch upon at this point in time. 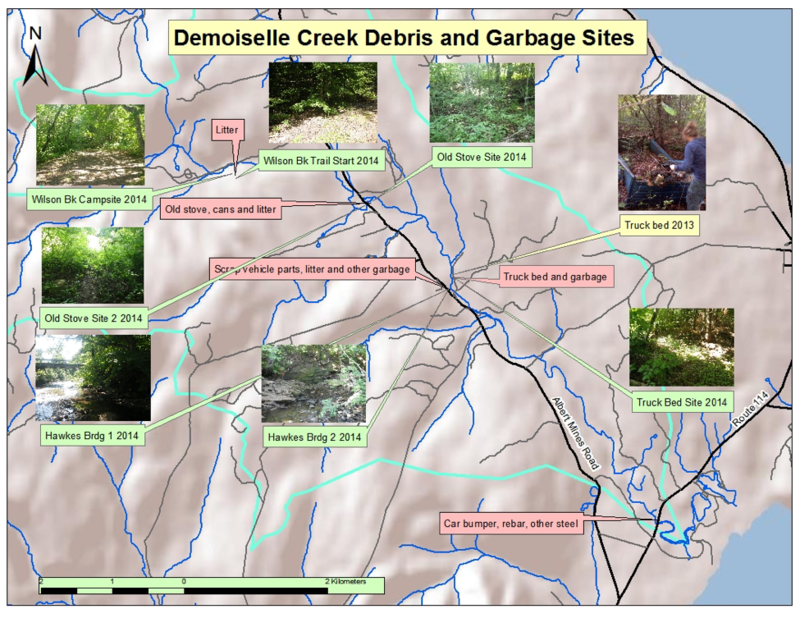 In 2013 debris was found and removed from three sites (Hawkes Road Bridge, Route 114 overpass, and Shepody Fish and Game access road) along Demoiselle Creek that had been first identified in 2010 (Figure 1-15). Not all of the material described in 2010 was found upon returning to these sites. It may have been subsequently cleaned up, shifted downstream by storm flow, or simply obscured by lush mid-July vegetation. Other debris sites noted during the geomorphic assessment conducted in 2012 were also investigated. Among these, debris was found at the Albert Mines Rd bridge site and the Wilson Brook headwaters near the “Underground Lake” Karst formations. July 29, 2013 – Initial follow up survey of sites first identified in 2010 and 2012. 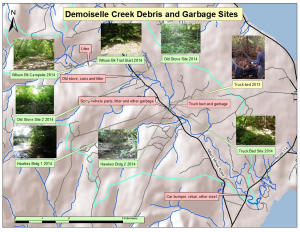 Sept 16, 2013 – Removed garbage from Shepody Fish and Game access road. August 1, 2014 – Re-visited sites to confirm sites are still clean, and took photos in Figure 1-15. Two possible restoration activities are described below, bank stabilization and culvert replacement. We do not anticipate any negative effects to the target species or their respective habitats. All of the prospective activities would improve the quality of the aquatic habitat for American Eel, Atlantic salmon and wood turtle. Bank stabilization could provide shade, reduce siltation, and provide leaf little and food sources for instream insects (prey of all three target species). Culvert replacement could help restore passage in areas where it is currently blocked by faulty infrastructure. Restoring passage will be most beneficial to iBoF salmon as they are the least able of the three target species to navigate past barriers. American eels and wood turtles are both capable and known to cross barriers via terrestrial terrain to navigate around barriers. Erosion is occurring along stretches where the vegetation buffer has been removed and turned into farm fields. The result is increased sediment loads and channel widening. Stakeholders and 2012 stream surveys both identified that sites without riparian buffer zones that were also experiencing erosion, were priorities for restoration. Selected sites may benefit from native tree and/or shrub planting to decrease soil erosion and maintain buffer/riparian zones along the creek. We will be working this season to identify landowners that would be interested in this option. Locations for possible bank stabilization activities are given in Table 1-3. Table 1-3: Locations that could benefit from bank stabilization on Demoiselle Creek. One person, 1-3 weeks, to accumulate cuttings, seedlings, trees etc. One truck (FFHR), pruners, loppers, mulch (possible source is Westmorland Albert Ltd.), 2 rakes, 2 shovels, gloves. Native, flood‐tolerant shrubs such as willow (Salix) or red osier dogwood (Cornus sericea) live stakes, or rooted alder (Alnus rugosa) shrubs have been identified as possible plants. These are typically planted with a spacing of 1m x 1m. Plant one or two year old nursery seedlings in a trench. If a trench cannot be made, remove some sod where the shrub is to be planted. Mulch laid on the soil aids greatly in keeping soils moist and reducing weed competition. Another method of establishing red-osier dogwood and willows is to plant fresh cuttings from established shrubs. If rooted plants are available, chances of survival will be improved. Prepare the planting area by ploughing furrows 7.5 – 12.5 cm deep (3 – 5 in. ), 1.8 m (6 ft) apart. Plant trees in the furrows. Furrow wetlands in the fall and plant the following spring. Lacking a plough, or where land is rocky or hilly, remove 1 square foot (one ninth of a square metre) of sod from each planting spot with a shovel and plant the tree in the centre. During planting, carry trees in a pail containing a few centimetres of water. Use damp moss or wet burlap for extra protection of trees in transit. Fence the planted area if grazing or trampling by livestock is a risk. The establishment and development of shrub and tree plantings can take place more rapidly with proper care. Plants lost to animal damage or winter kill off should be replaced. Plants may be fertilized to enhance their growth but this practice should only be done in combination with cultivation or mulching to reduce weed growth. Mulching with sawdust, straw or woodchips is often recommended to keep the soil moist and reduce competition from unwanted plants. 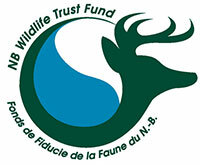 Based on current surveys, there are no known locations of inner Bay of Fundy Atlantic salmon, American eel, or wood turtle within this watershed. However, as this habitat may be accessible to these animals, this permit may be necessary. Any further development for this potential activity should continue to consult Bastien-Daigle et al. (1991) and the field manual for the community fisheries involvement program (Ontario Ministry of Natural Resources 1980). Stakeholders identified that there was a faulty culvert on Demoiselle Creek, which could be impeded fish passage. However, resource users were unable to identify the site of the culvert at our last meeting. We will revisit this potential issue in the future. There was also debate as to whose responsibility the culvert was, the DoT or the landowner. Once located, we will contact the DoT to enquire whether it is their responsibility. If it is, the faulty culvert will be reported. If it is the responsibility of the landowner and it is something that the landowner would like to address then we can try to source the appropriate sized culvert and submit a permit to DFO and Environment Canada for the work. Based on current surveys, there are no known locations of either inner Bay of Fundy Atlantic salmon, American eel, or wood turtle within this watershed. However, as this habitat may be accessible to these animals, this permit may be necessary. Canadian Environmental Assessment Act may require CEAA review if machinery is going to be used in the watercourse.